The tax code is complicated (see photo above; that’s why those books are so heavy!). Navigating tax season can be one of the more stressful aspects of homeownership, and the new federal tax bill has only further heightened the confusion around taxation issues related to homeownership. With tax day quickly approaching, we set out to lessen some of the anxiety around taxation by hosting our first Learning with Landed workshop with a local real estate tax law expert. While there is much to explore in the realm of taxation from ownership structures to tax treatment in the event of a gain/loss, we’ll focus this post on the basics: how are taxes calculated and what’s changed (in relation to homeownership) under the Tax Cuts & Jobs Act of 2017, enacted in December. The post below constitutes general information only. Landed is not rendering legal, tax, accounting, investment or other professional advice or services. This post is a broad summary. There are numerous exceptions and qualifications to the matters discussed. The application of any rule discussed may vary depending on your particular facts and circumstances. This presentation is not a substitute for professional advice, and should not be used as a basis for any investment decision or tax position. You should consult a qualified professional advisor with respect to your situation. Landed is not responsible for any loss or other liability sustained by any person who relies on this presentation. The amount of tax you pay every April depends on your Taxable Income. Subject to certain exceptions, your income is anything that increases your net worth: your salary, bonus, your March Madness bracket winnings, etc. These are certain expenses that you can deduct from your total income whether you claim the standard deduction or itemized deductions (more on that later). These expenses include such things as a limited amount of out-of-pocket expenses of school teachers, certain IRA contributions, etc. Individual taxpayers must choose to claim either the standard deduction or itemized deductions. The new tax law has significantly impacted this choice, particularly for homeowners. The standard deduction is a fixed amount that generally can be claimed by any taxpayer regardless of circumstances. (The amount depends on whether you file a tax return as a single person or jointly with a spouse.) The new tax law increased the standard deduction significantly (generally effective for 2018-2025 tax returns), with the result that it will be chosen by more taxpayers. In lieu of claiming the standard deduction, individual taxpayers may claim itemized deductions, which consist of specified out-of-pocket expenses incurred by the taxpayer during the year. Obviously, this choice makes sense if your total itemized deductions exceed the available standard deduction. 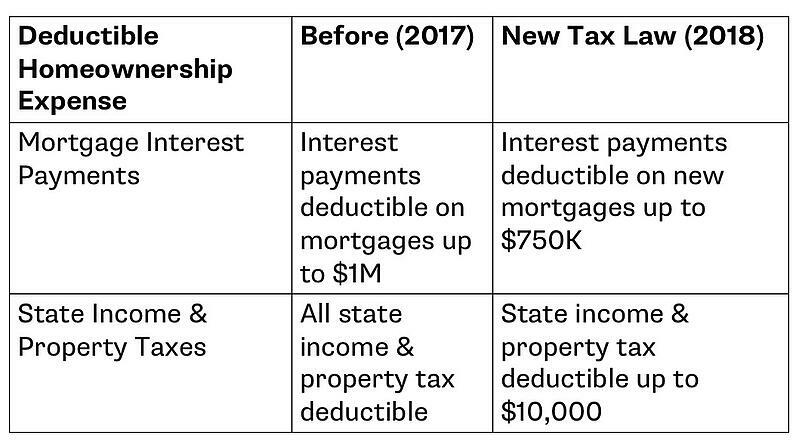 The new tax law eliminated the itemized deduction of certain items and placed a cap on other items (as described below), which will make the standard deduction the appropriate choice for more taxpayers, particularly non-homeowners living in states with low or no state income tax. Despite these new limitations and the increase in the standard deduction, it is likely that, given the high cost of housing and resulting high amounts of mortgage interest and property tax paid, many California homeowners will continue to find it beneficial to claim itemized deductions. Homeowners in other states may opt to take the standard deduction. The determination will depend, of course, on each taxpayer’s particular facts and circumstances. After you’ve subtracted your deductible expenses, your taxable income is the income that’s subject to taxation. Federal income tax rates are marginal rates, meaning that the rate you pay increases as your taxable income increases, but the highest rate only applies to the last portion of your income in excess of the income to which a lower rate applies. 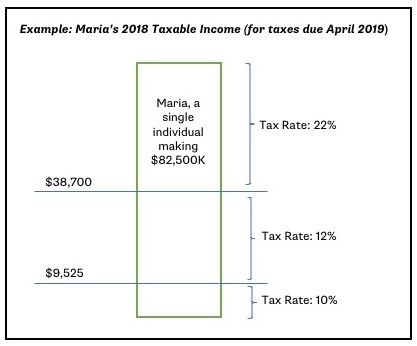 For example, for Maria, a single person with $82,500 of taxable income in 2018, the first $9,525 of income is taxed at 10%, the next $29,175 of income is taxed at 12%, and the remaining $43,800 of income is taxed at 22%. When someone refers to their tax bracket they generally mean this highest rate. Note that each additional dollar of deduction reduces your taxable income subject to the highest rate until it eliminates the income subject to that rate. Thus, for Maria, each additional dollar of deduction offsets income subject to the 22% tax and, therefore, reduces her tax by 22 cents. For example, let's assume Maria is a homeowner and is paying down her mortgage on her primary residence. Each additional dollar of mortgage interest paid by Maria, assuming she itemizes her deductions, only “costs” her 78 cents after taking into account the 22 cents of tax savings created by the interest payment. The new tax law reduced the number of tax brackets and also reduced the top rate from 39.6% to 37%. As a result of the changes in the rate structure and deductions, your federal income tax liability is likely to change even if your income remains the same. In addition, there are a variety of other federal taxes that must be paid by certain taxpayers, including, among others, alternative minimum tax, net investment income tax, and social security taxes. What does this mean for you? The short answer is that it depends your personal situation. As always, it is critical to consult a tax professional before making decisions affecting your personal finances. Is this still a good time to buy? While the new tax law has impacted some of the tax benefits associated with homeownership, the reality is that taxes are just one of many factors to consider when making the decision to buy a home. We encourage all our customers to consult a financial professional during their homebuying process. Many cities also have a number of fantastic organizations that provide free financial wellness support & coaching. SparkPoint, which helps clients achieve financial prosperity, and Earn It! Keep It! Save It!, which provides free tax preparation for households making less than $54,000, are two great resources for Bay Area residents. Best of luck filing your taxes and as always, please don’t hesitate to reach out to us at hi@landed.com with any questions at any stage of your homeownership journey.